I always keep a list of shots that I want after a fresh snowfall. This year, I’ve not had hardly any chances to work on this list! After a winter with limited snow…we finally had one of those great New England mornings where a weak system surprises everyone with a few inches of snow. The day before was warm, the forecast for today is warm, but for a few hours, the world was covered in a light, beautiful snowfall. When I woke up to see the snow, I had two ideas in mind. 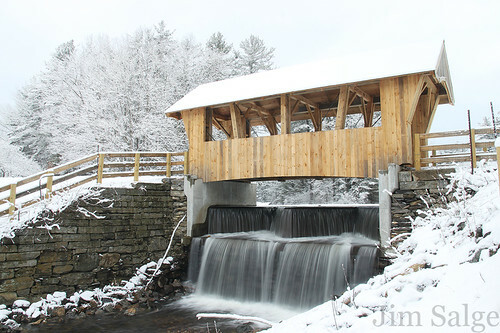 Maple sugaring, and the new covered bridge in Chester, NH. I flipped a coin, and was off to shoot the covered bridge. I’ll keep this post short, as the snow’s residence was just as short. It was almost gone by 10AM. But this was worth the scramble! An iconic view is one that has a spectacular yet simple view of a landscape or landmark that all who know New England can relate. It’s a view that resonates far and wide, that when hung on the wall in a coffee shop in, say California, people think of this beautiful region. I make it a point to shoot a New England beyond the icon, but always feel their draw. 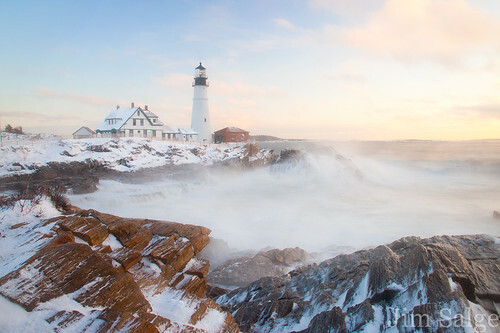 I’ve pulled over in front of the Mount Washington Hotel hundreds of times, and been to Portland Head Lighthouse dozens, but have yet to get a winter shot that rivals the literally thousands that are in the marketplace. For me, a shot of an icon has to be truly special. And finally, this vacation week, I have shots of both of these icons of which I’m truly proud. Clouds had choked out my view of Mount Washington from a vista in Bethlehem that I’ve been working on, and I had left a bit discouraged. However, as I was driving back towards Conway, the high peaks began to clear. By this point, the sun had long set, but it was not yet pitch black. Photographers call this time ‘The Blue Hour’, as the temperature of the light is extremely cool, and prone to saturation with long exposures. As I passed the Mount Washington Hotel, I was drawn to the remaining clouds surrounding Mount Adams. A thirty second exposure, and a stopped down aperture allowed for the color and light to come together. Strong hues of blue and orange draw you into the iconic landscape, which otherwise speaks for itself. Finally a snowstorm. And what a storm. It snowed for about 36 hours straight, and around a foot of snow accumulated by Friday morning on my deck. A quick check of the weather at 3AM saw clouds still overhead in SoNH, but some possible clearing over Portland, Maine. Worth the trip? Well, it was high tide…so why not. The whole way up, it remained cloudy. Not until I was in Cape Elizabeth, where the lighthouse resides, did I see any breaks in the clouds. But over the lighthouse itself…it was miraculously clear. The conditions were tough! The wind was strong, and the waves were ten to fifteen feet. The wind blew salty spray up over the rocks with every wave, dampening the lens and ruining most shots. But a few were clean. I used a neutral density filter to slow down the exposure and blur the roiling ocean. The snow clung to the rocks. The sky was pastel. And a unique shot of an iconic New England scene was slayed! Two shots off my list…but amazingly, the list is no shorter. Plenty of other iconic views around…waiting for perfect conditions! One of the best views of the western side of the Presidential Mountain Range is from the Cherry Mountain/Owl’s Head summits in Twin Mountain. The hike is modest, with a five or six mile round trip, so although it’s not a difficult hike, you are committing to one shot if you hike the ridge. The problem with that commitment is that the view is of one of the most temperamental ridges in the world, and the view is prone to clouding up, and unexpected changes in weather. And thus, has come my dilemma, time and time again. I value flexibility in the evening shoot, and like the ability to change my mind depending on how the conditions develop. Committing to one view is risking the entire evening. This year though, I was determined to shoot from this ridge. In my annual goals post last month, I stated that I wanted to take greater risks. And earlier this month, I did…hiking up to a clouded in view. Hardly a waste! The forest was glistening in rime ice and the forest was alive with rare boreal birds. Unfulfilled, this weekend, I tried again! This time, I was fortunate to have some friends and fellow photographers with me, and made the time go quickly, and the risks of hiking after sunset less. The hike was similar…the rime level was a little higher up, but there was little snow underfoot, and the travel easy. The view from Cherry Mountain was spectacular, but a little shielded, so we hiked the beautiful Martha’s Mile trail to the wide open ledge on Owl’s Head. And waited. It was a beautiful night. Few clouds over the Presis, light winds, cold, but refreshing temperatures. Everything was setting up perfect…until a layer of cirrus on the horizon choked out the alpenglow at the last minute. Gone was the light. So I took out my camera again, and captured my favorite shot of the ridge from the west that I’ve ever taken. Not what I expected. But Beautiful. Perspective. 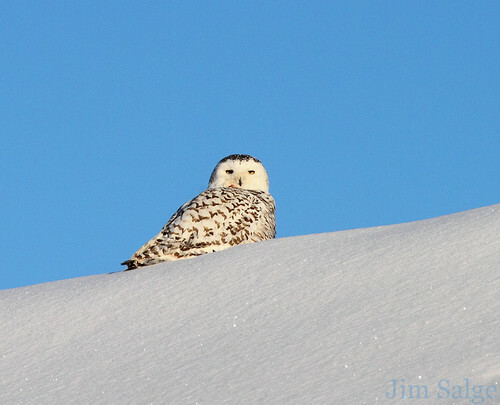 Until this winter, I had never seen a snowy owl. These large, beautiful birds live in the far arctic regions of Canada, and only come down to this area in rare winters, so it’s not surprising that I’ve never seen one. With the owl irruption this year though, I could perhaps consider it rare to visit the coastline without seeing at least one owl. The influx of owls has been well documented both around New England, and around the nation, and these birds have been garnering a ton of attention. I was fortunate to get some shots of the birds at Hampton Beach before they became an attraction, as getting a shot going forward is going to become increasingly difficult due to the crowds of observers. Wildlife photography is a touchy thing. It required a large amount of time, a great deal of patience, and some rather specialized equipment. The less specialized your equipment, the more time and patience you need to get the shot. You have to slowly earn an animals trust, and move slowly in until you get the shot, being careful never to cause the animal any stress. I’ve been putting in the time for sure, probably gaining about two dozen trips to see the owls, and witnessing some great behavior…hunting, resting, flying and once witnessed two owls sparring mid air. However, with other folks around, I generally consider it rude to slide in towards the owl while others are enjoying the sight of it, or getting their shots with far more specialized glass. This has limited my ability to get shots, and has honestly changed my mindset when visiting the birds, back to the purest form of being a naturalist. I’ve been observing, watching, asking questions, and getting great answers from the more experienced birders in the state, who are there every weekend. Watching and experiencing nature is why I became a photographer, as I wanted to share and inspire and protect. Some experiences are tough to share, but are the type of experiences that have been instrumental and formative in my desire to photograph. Perhaps, it’s important for everyone to know that as well as my photographs convey an approximate reality, there’s nothing like being there yourself! It always happens that as I put on the radio in the wee hours of the coldest morning of the year, I’m bombarded with the message that it’s just simply too dangerous to go outside. That message saddens me, as when the mornings dawn clear, with temperatures well below zero, it’s simply too beautiful NOT to go outside. When it gets really cold, neat things happen in the atmosphere. Ice crystals form right in the clear air, and dance about glistening in the sunlight. Mist and seasmoke fill the air above any open water. Long crystals of hoar frost coat the trees. And the intensity of the morning light is unparalleled. The air itself feels different too, it’s dense and honestly feels great to breath! Going out in these conditions requires proper gear, but I rarely find myself in serious discomfort while shooting. I’ve blogged about proper gear in the past, and taking proper precautions, I’ve yet to lose a limb or had any ill fall upon me befitting the stark warnings I always hear. This past weekend was by far the coldest weekend of the year so far, and I set out to ‘reshoot’ some scenes that I wasn’t ever happy with last year. The first was from an overlook in North Conway, which had been recently cleared allowing a beautiful view of New Hampshire’s most “Prodigious Hilltop”. I shot a variety of compositions here, from centered to offset to pano pan. I’ll let the viewer decide which they like best. I like them all…such great atmosphere! 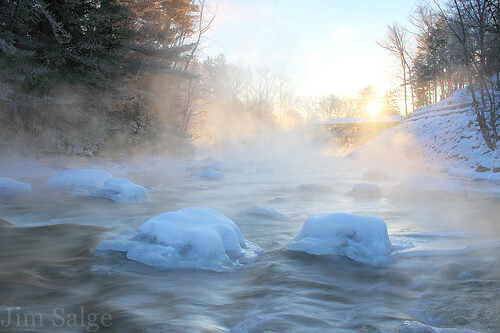 From there, I drove a few miles down to the dual covered bridges in Conway, and crept down to the river, and cautiously out onto the ice to get the sun rising through the mist over the bridge and river. The light was ever changing, and keeping the mist from icing the lens was a challenge, but the scene remained captivating for about 45 minutes. By this time, the sun was high, the temperature was above zero, and I was itching for a cup of hot tea. So I went back inside to a local coffee shop…where everyone else was complaining about the cold, and ignoring the beauty surrounding them. Goal setting is important. Keeping a strong focus on your goals is even more important. Last year I set a long list of goals, and was rather successful at keeping many of them, partly because I wrote them down, posted them in a public place, and revisited them often. In the past year, I’ve gotten some dream shots in Tuckerman Ravine, on Mount Clay, and Mount Monroe. I spent time diversifying my style, shooting from my kayak, and moving into some wildlife shooting. 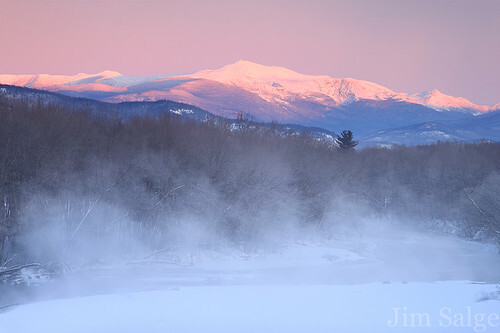 And I continue to seek out the very best mountain scenes in New Hampshire in the very best light. Some of my unfinished goals from 2011 will be a good start for 2012. Others are new goals that have evolved in my mind in the past year. These goals span the gamut of artistry and business aspirations, and all are centered around enjoying experiences in the outdoors and sharing it with a growing audience. 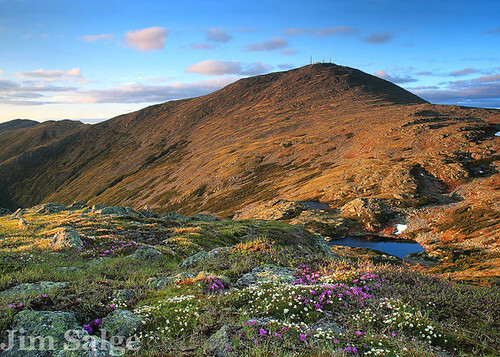 Goal #1: The Presidential Range. These mountains remain the focus of my photographic work. They just strike me in a powerful way, and I’m driven to share their power. I need to see a strong sunrise from Mount Hight, and Mount Adams still. Conditions and schedule have not yet intersected into that magic scene I have envisioned. 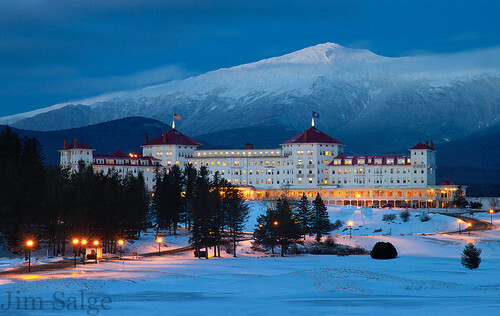 I want to spend more time up there in winter conditions, and am running a workshop on Mount Washington in March. Beyond that, I really want to share the delicate, fleeting beauty of the alpine blooms again this year…I want to spend time in the eastern drainages in summer… I want to find great light on the tundra in autumn. If all goes well, you’ll see some fresh takes on iconic scenes this year! 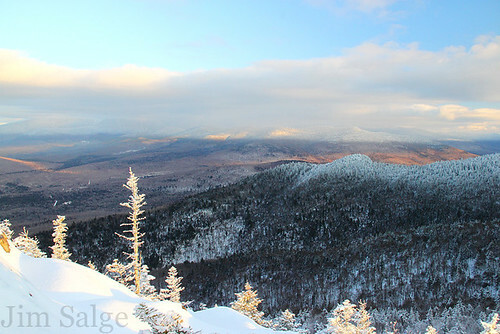 I have a good collection at this point of most of the easy to access viewpoints in the White Mountains. I want to explore deeper scenes. I’ve steered away from these scenes over the past couple years due to one main factor…maximizing time. It’s a risk to go deeper. You commit to a scene early in the day, and if it doesn’t pay off, you lose other opportunities that could have been made in changing conditions. But I’m at the point where the risks are worth it. I have a competent collection of the easy stuff. Time to take the risks! I’m never going to be a prolific wildlife shooter. My gear is built for hiking and moving fast. I have lightweight gear, with great zoom range, and don’t see that changing. But there are great opportunities to shoot wildlife within 300mm of reach if I’m patient and persistent. I’ve had good success this past year with loons, moose, bear and owls. This year, I want to carve out more time…especially in the summer when the landscape inspires me less, to spend time with birds and animals. Social media is amazing for building up a base of fans, and connecting with people who appreciate the view of New England that I work hard to share. My facebook page has been my default spot to share because it’s easy. But I need to branch out. I need to be more consistant with the blog. 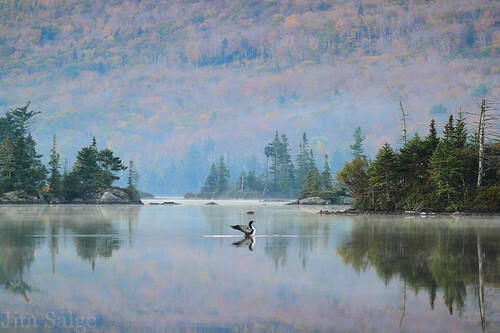 I need to establish a stronger presence in other venues, perhaps G+, 500px…who knows. Maybe that means working in an ebook format. Technology is making the world small, and I need to take advantage of that in networking and connections. Under this same umbrella, I want to continue exploring the notion of leading workshops or small groups. Insurance costs seem initially prohibitive, but perhaps with some creativity or collaboration I can make them work. Well…that should keep me busy, which is the point of this! Finding inspiration, and sharing where that inspiration find me will keep me busy in 2012. Hope you continue to come along for the ride! Has that twelve image standard changed? Ansel worked in a time before digital photography, a medium that allows immediate feedback, and continuous opportunities to perfect a shot of the scene in front of you. Gone are the days of spending weeks in the field without any reasonable feedback about what you’ve captured. Perhaps it’s therefore easier, and thus expected that you should make more than twelve significant shots each year. Beyond the number, I long dwell on the most important word in the phrase…significant. What does it take to make a significant photograph in a world where there’s so much cliche, where everything’s been photographed so many times over. To me, significant photographs capture a moment that others would desire to experience, and a photograph that brings the viewer into that moment. It’s what motivates me to be in the field as much as I can. It’s what my goals center around, and it’s what I believe my top ll photos this year capture. It was a good year for me photographically, and for my psyche surrounding my art. I have recognized that I can’t be in the field as much as I’d like, and that I must maximize every time I get out. I’m thrilled with the quiet moments on a mountaintop or lakeshore where all that I pre-visualized unfolds before me. And I cherish the unexpected that can bring a shot over the top. Most importantly, I’ve grown to accept that not every time I go out with my camera will yield a significant shot, but that doesn’t mean I’ve personally had an unfulfilling experience. 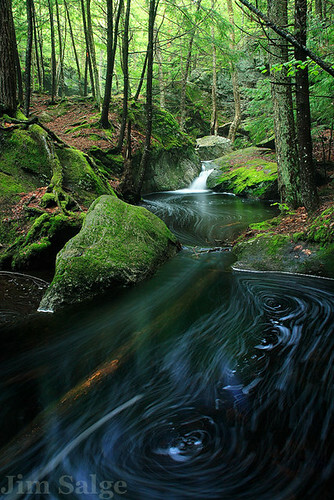 Any day spent in the outdoors is a day to be cherished, and if I can bring back a shot worth sharing, all the better. With all that said, here are my top 11 shots of 2011…in chronological order! I had some great winter shoots this past year, but didn’t manage to capture the iconic winter shots I’d hoped for. So it wasn’t until spring that I captured what I consider one of my most significant shots. A freak April Fools Day snow allowed for the rare combination of open water and fresh snowfall. 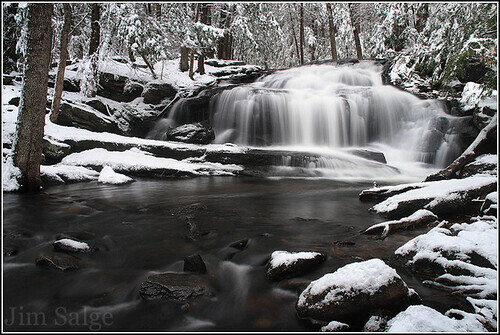 The snow in the trees was gone by mid morning, but I was thrilled to capture this shot of Tucker Brook Falls before it melted! This photograph, perhaps more than any this year, represents growth and learning within the natural environment. 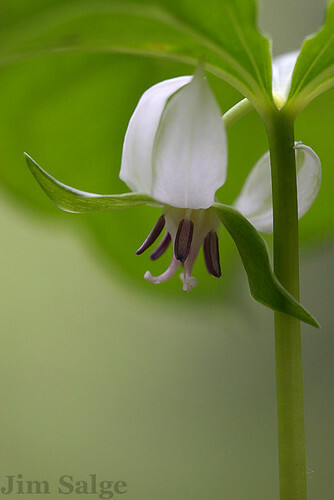 I had long wondered why the trillium on the Lamprey floodplain, near my home in Southeast New Hampshire, never bloom. Turns out I was looking in the wrong place, and wasn’t even aware what species I was looking at. A new species for me, the nodding trillium, was a hidden, unassuming flowers beneath the leaves. They were a challenge to capture, and I loved the results when I found an angle that worked! One of my goals in the past year was to carve out smaller blocks of time nearer to my house for photography. I simply can’t get away on a big adventure every weekend, and now try to do those at select times in Autumn, Winter and Spring. Exploring around my commute was essential to growing between big trips. I work in Bedford, NH and Pulpit Rock is just a few miles from the punch clock. It looked great after this spring’s incessant rains, and I was happy to explore the landscape routinely, even if just for a few minutes at a time! There are certain ecological events that I try not to miss any year. Instances like flower blooms and peak leaves might last only a few days though…and uncooperative weather or personal calendar can easily make for an sequence of unfortunate annual misses. I’ve not been up to see the alpine flowers on New Hampshire’s highest peaks in a few years, and made it a priority this year. The weather cooperated perfectly, and I was able to capture a broad landscape with the fleeting flowers prominently displayed. This photo reminds me of the importance to take risks. The forecast was terrible, with rain projected overnight and through the morning. 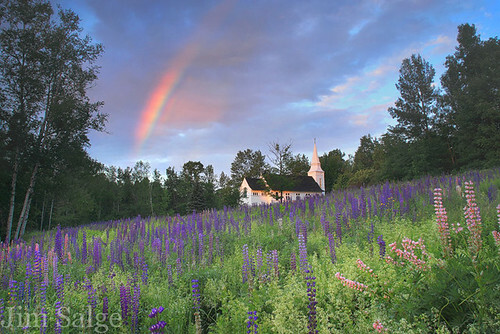 The lupine festival is not to be missed though, and I spent a restless rainy night in the car to find myself alone in a field usually filled with photographers at dawn to capture this special moment! Another of my goals this past year was to make better use of my summers. It’s a season where I have lots of time, but little inspiration from the natural world. The sun rises early and fast, typically without much color or atmosphere. The sun sets late, and the days are usually hazy and without appeal. Plus, I HATE warm weather! To reach my goal, I needed a different subject from my usual broad landscapes. This year, I spent a week kayaking with a local loon family in early July, and they became quite comfortable with my presence. 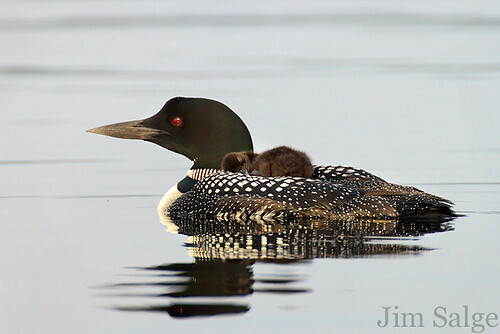 I love the connection of the loon and its mother in this shot! Five more shots to post for 2011…but we’ll save them for tomorrow! Then it’s time for some goal setting in 2012! The last post was getting a bit long, so we’ll pick up the yearly reflection after summer. I still have a really hard time getting significant shots in the summer. As a teacher, I have all the time in the world to do so, but in the endless green and blue, the hazy air and the drying streams, I never seem to catch the moment where inspiration meets light. It will end up on the goal sheet again this year for sure. I do love autumn though, and this year I had the opportunity to share my love of that season with a much wider audience, as I wrote a weekly foliage blog for Yankee Magazine. 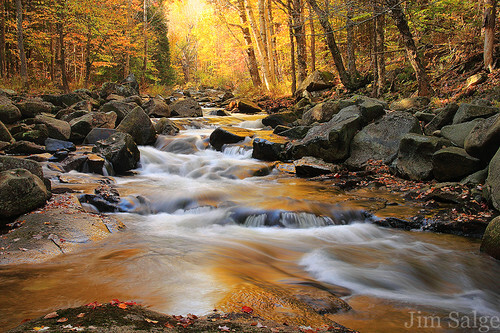 Writing a blog for all of New England challenged me to get out of areas I typically shoot in fall, and see some of the other iconic landscapes in the region. And despite the fact that the foliage itself put on the worst show in a decade, I came away with some of my favorite shots in years! This is a shot that I’ve envisioned for some time. 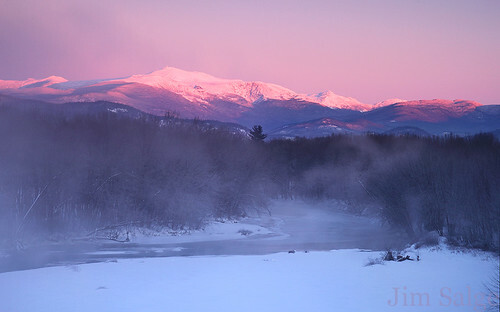 The Great Gulf is one of the largest glacial cirques in New England, and the the valley is ringed by tall, iconic peaks that catch the morning light in a most exquisite way. My friend and I scouted the area the night before, looking for the best vantage, and were up setting up well before first light. The display didn’t last long before the clouds choked it out, but I was glad they were there to provide balance and drama in the scene! 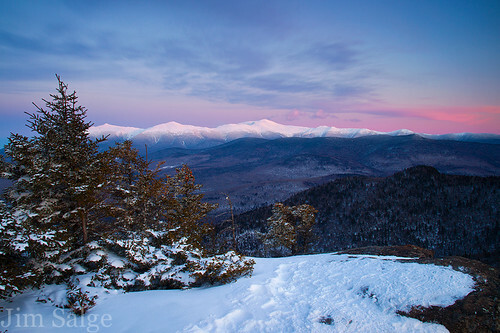 Next goal for this view…a winter sunrise! The hike up was miserable. Hail, thunder and lightning, wind alternated with sunshine, so frequent stops to adjust gear for the conditions were necessary, but I was in no rush, as I was hopeful for some late light hitting the clouds. That never happened, but the dramatic sky that I witnessed when I first came onto the lookout ledge more than made up for it. This is a classic scene in New Hampshire, and I’m thrilled to have captured such a strong image from an iconic outcropping. After Autumn, I spent some time nursing a nagging injury, and didn’t get out much with the camera. There was little reason to anyway fortunately, with a warm and snowless December. 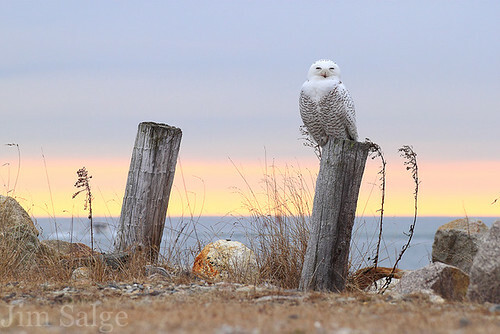 I finally got out again right after my holiday travels, and was fortunate to find out about a snowy owl that had taken up residence along the New Hampshire Seacoast. I spent a morning with the bird, all to myself, in great light. Just one of those moments I was happy to be out among nature, and am even more thrilled to have the ability and platform to share my experiences. It’s fun to look back at a successful year, but it’s even better to look ahead. I’ll be writing about my goals for the year in my next blog, and hopefully the weather patterns will change soon, giving me the opportunity to get some of the classic winter shots I have in my head. Thanks for following along this year…can’t wait to see what 2012 brings!